You may have the news that the eleventh in the Laures series is the replica IWC Da Vinci Chronograph Edition “Laureus Sport for Good Foundation”. 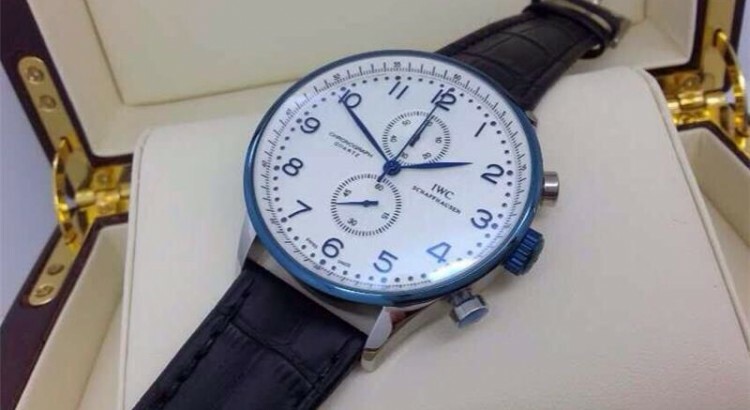 This fake IWC opens a unique edition timepiece and uses part of the proceeds from sales to assistant disadvantaged children and young people through the Foundation. 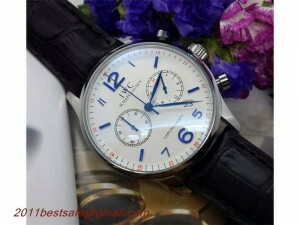 The elegant model is housed in a round stainless steel case measuring 42mm in diameter and 14.50mm in thickness. The case is featured by the newly developed moving horns with curved lugs which ensure that the black alligator leather strap by Santoni fits exactly on its future owner’s wrists. There lies a beautiful blue dial underneath the front sapphire glass, whose lay-out looks like the one on the Portugieser Chronograph with the hours and minutes displayed on the central dial and the small seconds shown on the counter set at the 6 o’clock position. There is a black-on-white date window as well. Furthermore, there is a red-tipped central seconds chronograph hand which can be reset and restarted instantaneously by pressing the push piece at the 4 o’clock position, all these should be owing to the flyback function. The hour and minute counters have been combined in the sub-dial situated at the 12 o’clock position, so that the stopped times can be read off as if on an analogue watch. This fake IWC Da Vinci Chronograph Laureus Edition is powered by the in-house caliber mechanical chronograph movement which works at the frequency of 28,800 beats per hour (4 Hz). The self-winding mechanism has a 68-hour power reserve and draws its energy from the automatic replica IWC double-pawl winding system, thus transmitting energy to the pawl wheel. The jury chose the drawing made by a 12-year-old Chinese boy Hou Ye from Shanghai. His winning picture shows himself on skis setting his personal best time. The most interesting detail on this special edition timepiece is the case back of the cheap replica watch which is engraved with a reproduction of the drawing that won a match for children and adolescents in the context of the foundation’s projects with the subject “Time Well Spent”.